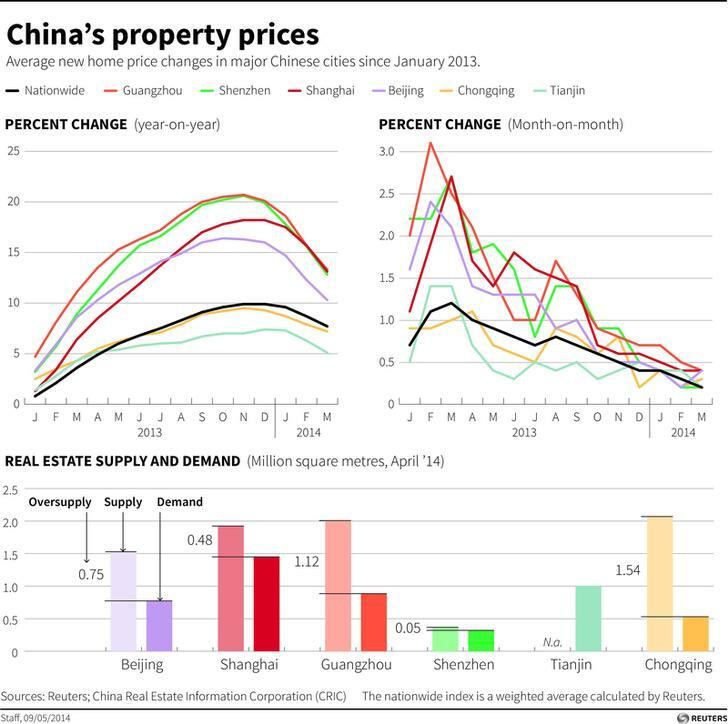 China’s property market is built on a vicious triangle. There are three ways the pressures building in the real estate industry could show: shrinking investment, disappearing funding for developers, and lower prices. Though they’re all related, the effects and remedies are different. Glum economic data makes a plunge in investment look like the most pressing threat. In the first four months of the year, housing starts fell 25 percent year on year, the worst slump in over a decade. When investment in real estate slows, growth does too. In April, almost all of China’s big economic numbers, from fixed asset investment to retail sales, decelerated. Another source of concern is funding for property developers. Borrowing from banks has given way to other sources of finance, like trust companies. Perhaps the biggest source of over exuberant funding is credulous homebuyers who, deprived of other savings options, have continued to pay for properties yet to be built. Balance sheets are showing strain. The 111 mainland China-listed developers for whom data is available on Eikon saw their combined debt grow 20 percent in 2013. Their aggregate net debt is now 4.3 times EBITDA, compared with 3.4 just a year earlier. Consolidation is inevitable, and useful. Greentown, a Hong-Kong listed developer that has already sold land in Shanghai to raise cash, may sell a 30 percent stake to rival Sunac. The third side of the triangle is house prices. Outside Beijing or Shanghai, these are still in the realm of fantasy. The average urban worker has annual disposable income of 27,000 yuan. That’s enough to buy just one square metre of housing in Shenzhen, according to national data. Prices are unsustainable because supply is too. China has built 7.5 billion square metres of housing since 2005 – demolitions aren’t reported – with another 4 billion square metres still in the works. If an average house is 60 square metres, and holds 3 inhabitants, it’s enough to accommodate around 575 million people, almost China’s entire urban population. What can be done? It depends on which side of the triangle gives first. If it’s investment, China can force new building, as it did in 2008. Its leaders seem to have other ideas, however. President Xi Jinping has warned it’s time to get used to a “new normal” level of more modest economic growth. Besides, there’s no sign yet that job creation is slowing down, or that lay-offs in the construction industry are causing social strain. Developer funding is more complicated. If builders can’t finance themselves, bankruptcies and bad loans will sprout, and homebuyers whose houses are paid for but unfinished could be left empty-handed. A credit squeeze will also knock investment, as developers stop building through necessity rather than choice. Forced mergers of developers and assistance from state banks could help avoid a meltdown. A recent central bank entreaty to banks to keep making mortgage loans will help too, since banks’ reluctance to allow mortgage draw-downs worsens developers’ cash problems. Over time, though, having fewer, more discerning builders looks better. Falling prices are the biggest worry. True, China’s homebuyers don’t have lots of household debt. Mortgage lending increased by 3.5 trillion yuan between the end of 2010 and 2013, according to Oxford Economics. That was equivalent to just over a fifth of recorded residential property transactions over the same period. But much other lending is still backed by property. A sell-off that saw prices fall sharply could test even generously collateralised lending. A national crisis is unlikely because of China’s vast regional differences. In some cases, falling prices have provoked angry scenes from homeowners; in others they passed almost unnoticed. But that also makes it tough to foresee where a crisis will arise. Some local authorities have been loosening buying restrictions, but it may be hard to promote buying in one city without causing selling elsewhere. Prices are above all unscientific, which puts them beyond the comfort zone of China’s planners. Even dexterous governments struggle to prop up house prices once confidence has gone. And without widespread belief in future price gains, developer funding and investment will evaporate too. As houses get cheaper, it will soon become apparent that the triangle cannot hold. China’s house prices fell to an eleven-month low in April, according to data released on May 18. Existing home prices dropped from a month earlier in 22 of the 70 cities surveyed, compared with 14 cities in March. Smaller cities including Ningbo, Nanning and Tongling have already announced plans to loosen rules that limit purchasing of houses. Other cities attempted to relax rules in 2012 but were forced to reverse course by the central government. Greentown, a luxury house builder part-owned by private equity group Bain Capital, said it might sell a stake of up to 30 percent to rival Sunac Holdings on May 16. Greentown sold some projects to Sunac in 2012, and attempted to sell land to commercial developer SOHO China, though the latter deal was later annulled by a court. Zhejiang Xingrun Real Estate, a developer based in Ningbo, was revealed to be on the brink of bankruptcy in March. Meanwhile, Shenzhen-based Guang Real Estate admitted in May that it failed to deliver projects in time to homebuyers because of financial pressures, though it claimed it still had access to finance.